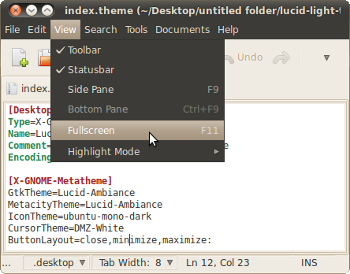 As I wasn't too keen on the updated Ambiance and Radiance themes that shipped with Ubuntu 10.10 (Maverick Meerkat), I've re-packaged the original versions that shipped	with Ubuntu 10.04 (Lucid Lynx) so that they can be installed along-side the current themes. They are works in progress and when I get a spare couple of minutes I'll add the original icon package and roll them up in to a .deb file. For the moment, you can download them here. Just drag the tar.gz files into your theme manager (or unzip them to your theme directory). To have the theme available to all users (and therefore sudo'd applications such as Synaptic), you need to extract the files from the tar.gz to /usr/share/themes instead of your home directory (~/.themes). If you've already installed the themes in you home directory - the default if you drag and drop the tar.gz into your theme manager - the following command will copy them over the the system-wide themes directory for you. 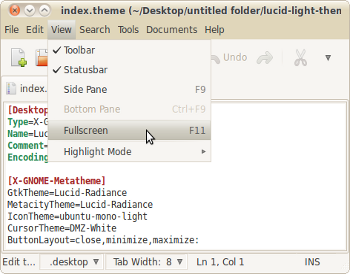 These are the original light themes (version 1.6.6). I have not created these themes, I've just repackaged them so that they can be installed along-side newer versions. Full kudos goes to the Ubuntu team who created them!